‘Disasters at Sea’ is a Canadian-made production that follows investigations of ship disasters around the world, painstakingly recreated in Ontario locations. Braving the elements of a Canadian winter, a stuntman is hoisted into the air, buffeted by wind, rain and ocean swells – only this isn’t the English Channel, but a paved lot at Marine Recycling Corporation in Port Colborne, Ont. For the Canadian crew shooting the Discovery Channel's ‘Disasters at Sea,’ the challenge of recreating a daring sea rescue is a blend of practical effects and creative ad-libs. "We have a duty to get it right," executive producer Kelly McKeown told CTVNews.ca. “These are real life incidents that happened and our information came from official reports and investigations.” Those incidents include the harrowing rescue of the crew of the MSC Napoli in 2007 that saw search and rescue teams lift the 26-man crew one at a time onto British Royal Navy helicopters. Rain and wind machines simulate the storm surrounding the rescue attempt, while a specialized water cannon simulates swells hitting the side of the lifeboat. 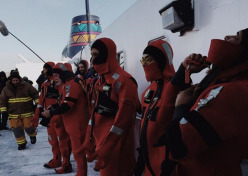 The actors and stuntmen have to wear wetsuits under their costumes (recreations of thermal lifesuits worn by crew members navigating frigid waters) in order to prevent them from freezing on set. A winch cable looped over a crane arm becomes a helicopter rescue lifeline, and one by one the actors are lifted into the air - in this case, the rescue is successful, but not every sea disaster ends well. The deep dive training pool at Seneca College becomes the Bering Sea in another episode, where director P.J. Naworynski and his team have the task of simulating a call to ‘abandon ship’ into freezing storm tossed waters. Weather machines, wave simulators and cloth-covered scaffolding mimicking the hull of a ship allow actors to convincingly ‘fall’ off the side of the damaged ship. The pool at Seneca College in the Toronto area allows an underwater cameraman to get all the dramatic shots of a helicopter rescue seen from below -- shots that otherwise would be incredibly difficult to obtain. Master Mariner Christopher Hearn was brought on by the team to provide expert opinion and insight into what life at sea is like during an emergency. The shipping industry is complex and has a vast history, which is why experts like Hearn are essential for the series to remain authentic. “I help the writers and the production team understand the technical side of shipboard operations and the terminology-processes,” Hearn says. He also puts a human face to each story, as he explains what people were doing during the various crises explored in the series. His designation as master mariner is the highest maritime qualification one can achieve.